The great weather and a full resort continued through the first few weeks of August. As with most years the early school starts and fall sports curtailed many family vacations. Some of the unusual weather this summer had also continued through the month. There were a few days of really strong south winds and some heavy rains but, you know what everyone says about the weather up here just wait an hour or two and it will change completely. We had tremendous feedback on the renovations to Cabin 13 and have a couple of cabins in site for renovations beginning this fall and into spring. Keep a close eye out for updates in future newsletters and Facebook! A couple of big events are going to take place in the month of Septemeber. The Harvest Moon Fest is the weekend after Labor Day and Ely’s Second Annual Ely Marathon, is happening September 23 and 24. Here’s the link http://www.elymarathon.com/ . Good luck to all of our young guests/friends in their school and sports endeavors this school year. Taylor left a couple weeks ago for Winona State to finish off his 4 year degree in elementary education. Have a great 2016/2017 school year and we look forward to your next trip home! We still have some great vacation opportunities available. It’s never too late to make those last minute plans to visit us and the Ely area. Make sure to call soon to guarantee the cabin and week/weeks or days you prefer. Please check the web site www.whiteironbeach.com for all the current up to date info and specials. We are already getting many inquires for the 2017 season. If you did not re-book before you left this summer please call or write soon to lock in your favorite cabin or cabins. It is for sure summer in Ely. The walleyes have slowed down significantly this month due to more vacation weather than fishing weather and temps. There are a few being caught but it takes some time and determination. The crappies, northern and bass are readily available. 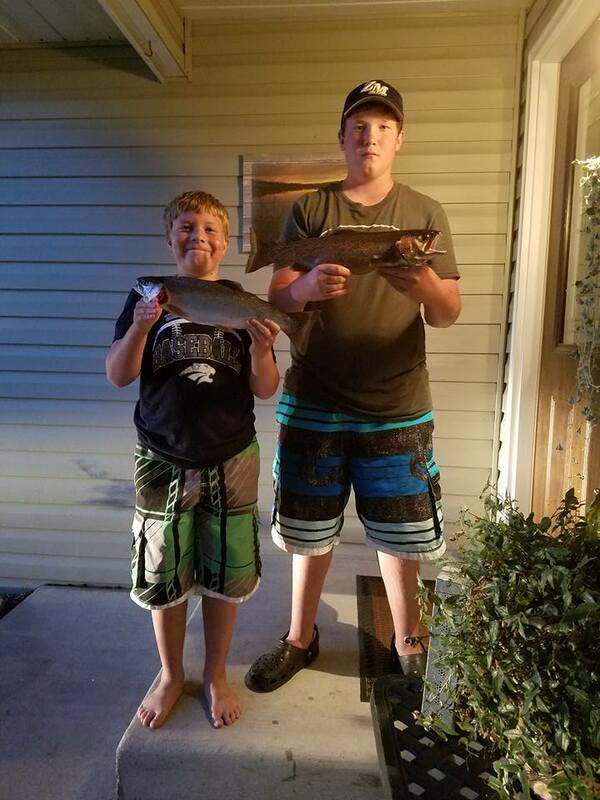 Even a few trips to Miners Lake for rainbow trout have been successful. As the water cools a bit toward the end of August I’m sure the walleye fishing will improve as it will throughout the Fall. Some of the biggest fish are caught in the later part of the year. Plan your trip up now. Boundary water permits are selling out fast so please call if you have any desire for a guided trip in to Basswood Lake. Reservations for all BWCAW entry points can be made on a first-come, first-served basis starting 1/28/15. Reservations can be made online or by calling 1-877-444-6777. To get further info go to Bwcaw permit info.